Oh, hi. I’m Marie. I’m a functioning alcoholic and a heel-striker. Thanks for stopping by my depraved, little corner of the interwebz. I currently type on keyboards in Indianapolis, where power brokers and corn farmers live together in harmony. I like it just fine, but I wasn’t born here and if you call me a Hoosier I will eat your face. I’m a mom, a runner, a writer, an instigator and a pleasantly furious leftist with just a few more things to say before my untimely collision with a Mack truck. I talk a big game, but I have absolutely no certification, accreditation or qualification for anything I talk about in this blog. Just read it and don’t ask questions. Sometimes I will post pictures of particularly disgusting or delightful foods I eat. But this is meant to be a humor blog and not one of those “healthy living” blogs, so I don’t feel obligated to justify any of my choices to you. I like to read a lot and do other things too, but since I decided to make this a running and beer blog, you probably won’t hear too much about it. One more thing: I only take horrible race photos. You won’t find any smiling, breezy, flawless, effortless, sweatless, jumping up and down arms raised in victory photos on this blog. I think I can get behind your blog based on the booze and pink floyd references alone. Mazel Tov! Running and beer, two of the best things in life! Love your blog. Well-written and witty! aw thanks.. I like yours too: “athletic mediocrity” — that’s a great line! I just moved to Indy from Chicago and love your blog! Drinking and fitness are my two faves too 🙂 I love your tagline. thank you so much! We have family up there so we make the Indy-Chicago drive several times a year. I love Binny’s! 🙂 Looks like you have just joined the bloggy world – welcome! I can relate!! 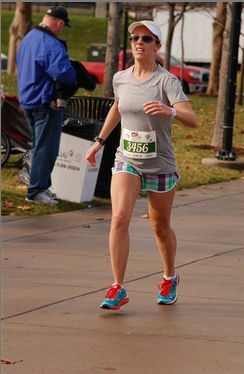 Just started blogging today to motivate myself to keep running! Does that make sense? Absolutely! It helps me hold myself accountable. I can’t tell you guys, “oh, I’m going to run 10 miles today,” and then not do it! hahaha. Love the name of your blog. I will definitely check it out! Bahaha. I started blogging (poorly) about a week ago, and just now found your blog. It’s hilarious. Straight to google reader with you. Running and beer? Yup, you have a new fan. Love the beer/ running combination! Oh yes..and the food 🙂 Great blog! Thanks for stoppin’ by! I guess I had my 15 minutes yesterday, eh? Geez holy, why aren’t you in my reader. Drinking and running. I can get behind that…probably far behind because I’m slow, I hate spilling my beer while running. Just found you’re blog and you’re friggen hilarious. Thanks for being so honest and excuse me while I click on over to my reader. Your first picture–funny as hell! Your second picture–hot as hell! And greetings to a fellow Floridian! Eh. Drinking involves too many calories. I’ll partake in the Pompeiin festivities with you instead. Funniest blog I’ve come across yet. I feel like I should get a royalty or something. At least a free t-shirt. $34.99 value. That would be exactly $34.99 more than I’ve ever made from blogging! I’m writing an article for Canadian Running magazine about runners and blogs and I’d like to ask you some questions about it. Can you please send me an email? I also take horrific running photos. It always looks like my face is melting off or I’m in excruciating pain. i am incredibly glad you requested to follow me because you are hilarious and, unlike so many bloggers, an actual human being who does normal things. thank you! the end. Hi there. Loving this blog. Thanks for making my newly found insomnia more bearable! Hey, thanks! Sorry about the insomnia though. Hopefully there is a kind doctor with an itchy prescription writing hand in your near future. Hi! I love your blog. I am not anywhere near an avid runner, but just started to get back into a fitness plan that involves some treadmill action. You’re blog is inspiring and hilarious. I am also a new mom and loved your rant on breastfeeding on a plane, you deserve a medal… and some singles. Just found your blog through some other ones I read – this is freaking hilarious. Thanks for the laughs! ::blushing:: Thank you! Aren’t you glad I didn’t decide to do something IMPORTANT with my writing degree?? You blog name alone just had me on the floor laughing…love it. Love your humor! Hey, thanks! Tell the people who hand out the money to bloggers! JK BUT SERIOUSLY. Hmmm… Beer and running… What’s not to love? Just found your blog, as I work for Hendricks Regional Health and am researching linkbacks…you must have mentioned us in a blog. I’m so glad I found your site – you are hilarious!!! I am not a runner, but I play one on TV. I signed up for two minis this year and bailed on both of them, but I did run two last year. Does that count? What if I promise to get back on the wagon and sign up for the Mini? Oh heeeeey, I love the Brugge. I think I’ve even blogged about it. I’ll have to come in for a beer once I pop this kid! craft beer. And I’m writing to ask for your help. helping us continue to get the word out about the great craft beer community. And we appreciate the assistance very, very much.